What to do with this hard drive? A few years ago I rebuilt my PC. 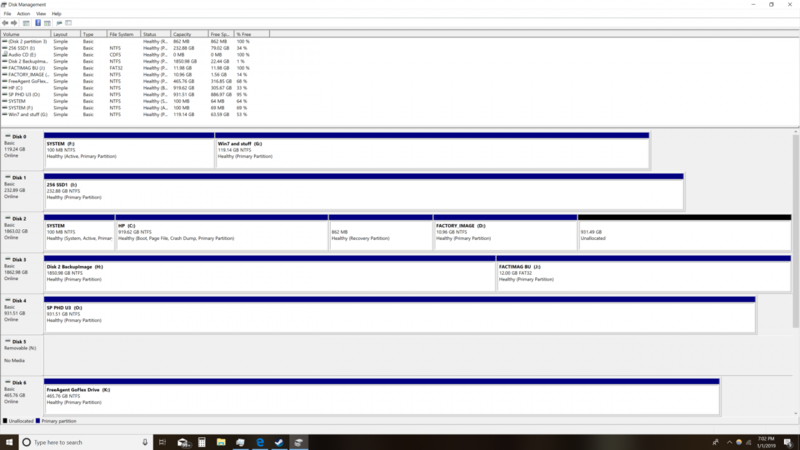 I am very happy with it except for one thing: the way my main storage drive is partitioned. I have attached a jpg of how it is partitioned. My preferred solution would be to expand C:. is the possible? Should I do something else like create a new volume and move all of my Steam stuff there? Can you post another screenshot of Disk Manager but this time expand it to full screen first, we are missing info in the one in your OP. Something that I will mention is that I notice that you have a HP factory image, is this for the same version of Windows as you are presently running or is it an earlier version such as 7 or 8.1 and you are now running Windows 10. Thanks for responding so quickly. I've attached the picture you asked for. I don't know what is in the factory image. It may be Windows 7. I did the free upgrade to windows 10 a while ago. When I built my current PC I simply copied stuff over from the Compaq I had at the time. Let me know if you need anything else. Apologies for the delay pabadger, had visitors yesterday. The unallocated space on Disk 2 would be better used for storing data on and not for expanding the C: drive, explanation below. Windows should ideally be on its own drive or partition, this helps Windows to boot up more quickly and helps to protect Windows from becoming corrupted. Any new build that I now do will have an SSD with a minimum storage capacity of between 240 and 256GB just for Windows, future Windows + Windows Defender updates and the most important applications, Windows boots up almost instantly and one of the main reasons for this other than it being on an SSD Windows hasn't got a whole lot of other space on a mechanical HDD to check before Windows knows that it is safe to load. The Windows 7 back up is ok to have but only because you have so many storage devices and free storage space available, unless you ever plan on going back to Windows 7 it would be better to be gotten rid of and an up to date back up image of Windows 10 created instead. Thanks so much for your advice. 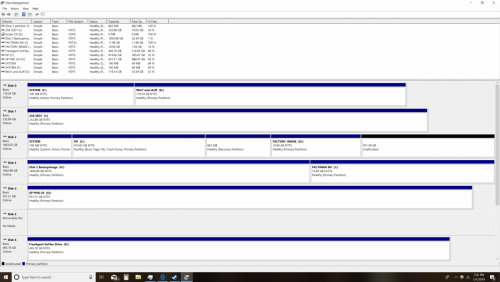 I thought I had put windows in I: which is a 128GB M.2 drive. As for what to do with the rest of that storage, I will go ahead and make that my steam volume.